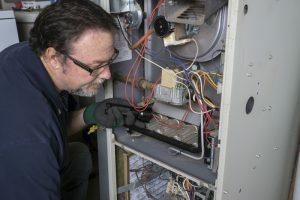 Fall is Around the Corner: Time for A Furnace Check-Up | Atlantic Refrigeration and Air Conditioning, Inc. According to the calendar, fall will be arriving soon. Whether or not this is actually the case is an entirely different matter; summer seems to be working on its own schedule in the last few years. Regardless, about now is the perfect time to have your furnace looked at. Why now? For one, any problems with your furnace can be fixed at your own leisure. You won’t have to be stuck in the cold waiting for an HVAC repair crew (who will be busy doing repairs for others). Second, if there are any serious issues, you’ll have plenty of time to budget or set aside money for the costs. A maintenance check will prevent several problems that your heater can develop, but we want to make a special mention of carbon monoxide leaks, simply because they’re so dangerous. Without a carbon monoxide filter in your home, there’s no way to tell if your family is in danger from one. Carbon monoxide is a colorless, odorless, and deadly gas. These leaks can happen for a few reasons, including a cracked heat exchanger or flue pipe, or if a clogged air filter blocks too much air. We recommend getting a maintenance check before the fall starts for this reason at the very least. Your heater is a finely-tuned machine that makes full use of all its parts. If even one of these parts begins performing less-than-perfectly, your energy usage will go up. At first, the different will be hardly noticeable, but continued wear-and-tear of the parts will lead to system failure. That’s why we and other HVAC specialists recommend annual maintenance. Once a year is a reasonable time to catch any of these issues before they become full-blown problems. Many homeowners are content with waiting until their system fails before they put any money in repairs or maintenance. However, we highly discourage this. After all, would you treat your car the same way? We’re much more likely to keep up with car maintenance because the thought of breaking down on the side of the road is a scary thing. Not only that, but car repairs don’t come cheap. We often don’t think of our furnaces in the same way, but they’re not so different in this regard. It’s been an entire year since your furnace has been looked at. If you fire it up now, the next energy bill you get might seem normal, and you might not second-guess it. In reality, a maintenance tune-up can help lower the operational costs of your heating system. As mentioned above, every part in the furnace relies on each other to be in excellent working order. If any of these are struggling to perform, it means the system will demand a little bit more time and energy. This can add up significantly over time and eventually culminate into an increase on your monthly energy bill. Now’s the perfect time to get your furnace looked at. Contact Atlantic Refrigeration & Air Conditioning, Inc. to schedule a tune-up.